Our Notion Ink Adam pre-order is nowhere to be seen. But that’s okay. I have the Internet and so do you! Notion Ink’s first tablet started shipping last week and is slowly making its way to anxious owners. Notion Ink curiously curated a crazed following of fans with nothing more than constant blogging from the CEO coupled with swanky user interface screenshots. The company managed to sell out of its first round of pre-orders without even showing a picture of the final product. The first live demo hit days after sales started. Well, those who bought-up the first batch are just getting their tablet now receiving their units and posting their impressions to fan sites and forums. Spoiler: It’s mostly bad news bears. 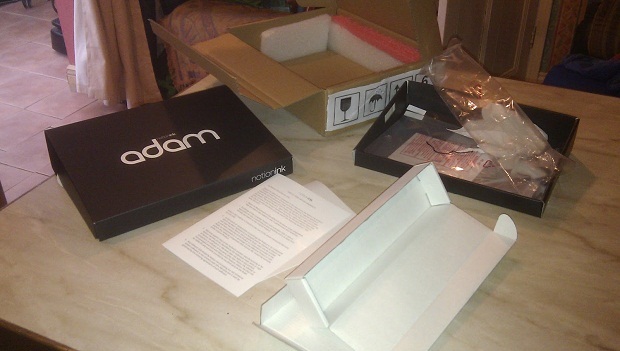 What follows is every user review of the Adam I could find in no particular order with just a bit of formating for readability. pros: battery life is great, loud speakers. I feel that this product was released too early and needed more maturation time. Anyways, Im uploading a vid right now so stay tuned. Hopefully a software fix will help with a lot of the issues people have been having. As for me, gotta get a replacement. that screen..
23. Resolution of 16:9 is great for videos, but for books, the page just seems a bit longish. My fault that I am used to the 4:3 aspect ratio of books and my nook…so this is a matter of habit. But it does also mean that reading in Portrait mode is weird. In landscape it switches to two page mode and feels more reasonable. 3. Yet to try any accessories. 4. The power adapter has US style pins. This is a shame for people in EU as here its mostly different. Since the adapter can work 100-240V, I guess we could use a pin converter. All in all good experience so far. But there is a lag once in a while. I hope the software update will fix that. My first thoughts…. The Eden UI is still a little buggy, probably something that will be fixed when the system update is working again. Google still thinks the device is in India. I could not change the time format on the home screen to a standard time format. I could not find any app installer pre loaded, we knew the market was going to be unavailable but I was under the impression there would be some installer.Also, I could not really figure out what the side buttons did, a long press just made them click forever, sometimes something would happen sometimes the would not. The menu buttons are also not back lit, so you cant see them in the dark. The biggest letdown was the POS screen protector! The base glass is very reflective. The screen protector is a huge help, but only if you can get it on without messing up. An impossible feet considering the protector does not fit perfectly and is slightly oversize. tl;dr: The first batch seems buggy at best and defective at worse. At this point I hope our unit doesn’t come. Writing reviews with more cons than pros is more depressing than spending New Year’s Eve with my mother-in-law.